Welcome our new followers Teri, Kenny/Angela and Lady Dyna Ryder. Thanks for coming on board. Hope you enjoy our adventure. Our first NOMADS project was a success. We completed all of the major tasks assigned plus a few others we discovered as we were working. Our new RV friends have all moved on to other places. Overall, it was a great experience and super blessing to see how God put together a team of volunteers who had the experience needed to get the job done. In my previous post, I failed to give you a little info on Odem and Sinton. 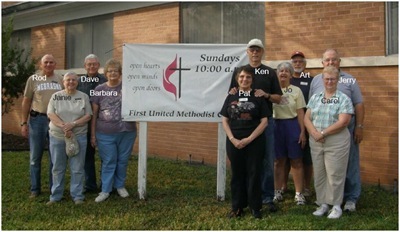 We parked in the overflow parking lot of First United Methodist Church Odem and worked about 7 miles away at First United Methodist Church Sinton. Our team project report is available here. I must warn you it is a large file. Odem was platted in 1909 and contains about about 1.1 square miles of land. The city is located about 20 miles north of Corpus Christi on US Highway 77. The city is at the intersection of two major rail lines that are heavily used today. I am certain the locals are accustomed to the train whistles as they approach the many street intersections. For fine dining, I highly recommend the Seafood Railroad Station. Sinton is the county seat of San Patricio county so it hosts the county court house as well as the San Patricio County Fair Grounds. Sinton is also at the crossroad of two major railroads as well as US Highways 77 and 181. Colonel George W. Fulton, founder of the Coleman-Fulton Pasture Company, received approval from the board of directors to give 640 acres for the town site of Sinton on the south bank of Chiltipin Creek in the late 1880’s. For fine dining, I highly recommend Back Street Café and Flores Mexican Restaurant. Our NOMADS team was given a private tour of the Welder Wildlife Foundation. This 7800 acre refuge is one of the largest private wildlife refuges in Texas. For additional information about this gem, please visit Texas State Historical Association On Line. They have an incredible collection of over 400 bird species and 55 mammal, amphibians and reptiles. They have a large library containing over 24,000 individual books and journals some dating to pre 1800. All of this is available for research to college students and research scientists. 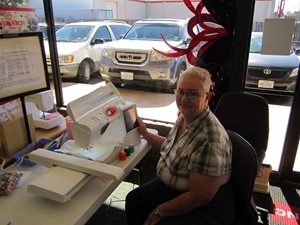 At the end of our three week project, Carol and I made a quick overnight trip to San Antonio for Carol to pickup her new Viking Embroidery Sewing machine. We had time to include a quick visit with Carol’s sister Donna. This entry was posted in Texas and tagged NOMADS. Bookmark the permalink.